Well, the central heating timer is creeping on, the scent of Goose Fair lingers in the air (do you smell the circus, Georgie?) and the Halloween inspiration is coming thick and fast….September is well and truly behind us and I am welcoming the long winter months with open arms and layers of chunky black knitwear! September was such a beautiful month, whilst I quietly celebrated the 2nd Birthday of Peach Berry Hair and Make Up Artist, I saw ‘Wedding Season’ out with the beautiful Anna and Fran’s weddings, held my first stands at two Wedding Fayres, accompanied by the gorgeous Hatty and met some lovely brides to be! I am so excited to have my 2018/2019 bookings well and truly underway and, for those of you who love a bargain, will be happy to take bookings at the current 2017 prices – so hurry to secure your date. In other news, I held my first full hair and make up booking with the gorgeous Nichola in September. Nichola and I met when she modelled for a vintage-style shoot I did with Jurgen at Rubicon Photography earlier this year. 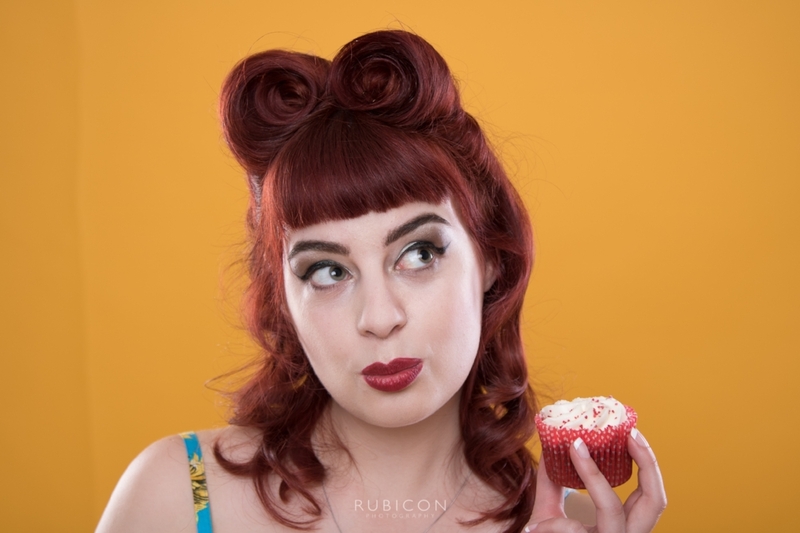 Nichola is a beautiful person – inside and out – and has a penchant for pin up and vintage modelling, so she wanted to learn more about how to perfect her every day make up and learn some tips and tricks for trying vintage-inspired hair styles. We had such a great time practicing different techniques and rummaging through her make up and skin care collection. One of my favourite things about what I do is having the opportunity to work with clients one on one to improve their confidence in make up application or hair styling and the beauty of a one to one make up lesson is that it can be tailored to whichever areas you feel you want to gain more expertise or confidence. Thank you Nichola for being such a great client, I look forward to seeing how your make up and hair skills continue to grow! Of course, it wouldn’t be complete if I didn’t talk about the incredible shoot I did at St James’ Hotel with Andrea Palmer Photography and a whole host of absolutely stunning local wedding suppliers. I want to write a full post about our shoot once the edited photos come back, but I am already spoilt for choice with the few Andrea has posted. It was such a highlight to work on this 20s inspired look and to spend the day in such a stunning location – thanks Andrea for asking me to be part of the shoot! So thereabouts is a roundup of September – other than working on the rather fabulous cast of The Boy Who Fell Into A Book, with the amazing Blind Eye Productions, some beautiful hair colours and a bit of a skincare discount with Skin Elixir (see my last post for details). October is shaping up to be exciting with Halloween bookings and my collaboration with the gorgeous Jo Way, plus it’s book release month….so for now, before I take a bit of a break away with friends, I would like to give a warm thank you to my clients old and new, who continue to support my work and recommend me to friends and family – you are making one little chameleon-haired lady very happy!